Gene Krupa CDs @ Hep Records, jazz in depth from the 1930's to the present day. Gene Krupa was born 15th January, 1909, in Chicago. He was originally destined for the priesthood but by the mid twenties he was working regularly as a jazz drummer. In 1929 he moved to New York and immediately found work in the upper echelons of jazzmen, most importantly with Red Nichols. He played with many name bands in the early thirties including Mal Hallet and Buddy Rogers. Although he had frequently recorded with fellow Chicagoan Benny Goodman it was not until 1934 after Goodman secured a contract playing at Billy Rose's Music Hall on Broadway that the association assumed a permanence. 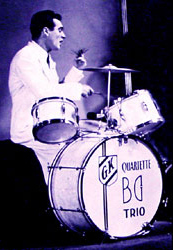 Then, as Goodman's star ascended in late 1935 and on the west coast the following year, so did Krupa's fame spread as the tousled haired, flamboyant drummer. The Goodman-Krupa association lasted till just after the legendary Carnegie Hall concert of January 16, 1938, when the drummer decided to form his own orchestra. In spite of his fame and the quality of his band real commercial success proved elusive until early 1941 when two great talents joined. Trumpeter Roy Eldridge was a well-established trumpet star but Anita O'Day had already failed auditions with Goodman and Raymond Scott but Krupa recognised her worth. The Orchestra recorded several classic recordings such as "Let Me Off Uptown", "The Walls Keep Talking", and "Skylark" which propelled it to the top thanks to the Eldridge and O'Day factor. Then, in early 1943, Krupa fell victim to a drug entrapment case and disbanded. After a short imprisonment he was released and he appeared one night in December 1943 with the Tommy Dorsey Orchestra to great applause and he was back on top. He toured with Dorsey for the next few months. He then reformed his own orchestra, this time with strings, in mid-1944 which enjoyed some success but proved to be uneconomic and with arrangers Eddie Finckel and George Williams proceeded to feature more advanced arrangements with new exciting soloists like Charlie Ventura and Don Fagerquist. There were new hit discs like "Leave Us Leap", "Lover", and when Anita returned "Boogie Blues!". In the 1946-47 period the band committed a large library to transcription recordings and these reveal the band at near its best. Anita was replaced by Carolyn Grey and modern song stylist Buddy Stewart. Krupa was aware of modern jazz developments and hired young arranger Gerry Mulligan who created the hits "Disc Jockey Jump" and "How High The Moon". But as the other top bigbands folded in the late forties, Krupa found the financial rewards dwindling and then he just gave up. In the 50s and 60s he devoted his time to teaching and touring with the Norman Granz organisation and leading small groups for special residencies. He even rejoined his old boss Benny Goodman and Teddy Wilson for overseas tours. He died on October 16, 1973. Krupa remains one of the first names in the history of jazz drumming and has left a considerable recorded legacy. 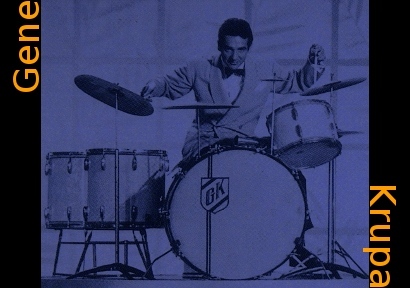 Gene Krupa - "Calling Dr. Gillespie"
Titles - Blue Lou / Summertime / Hodge Podge / Boogie Blues / Bugle Call Rag / Ain't Nowhere / The Man I Love / 10 Ritchie Drive / It's Up To You / Yesterdays / Margie / Night and Day / By The River St. Marie / These Foolish Things / Duke Ellington Medley / I Hear You Screamin' / Baby, Won't You PLease Come Home / How High The Moon / Birdhouse / It's a Good Day / You Be You / Dear Old Southland. Gene Krupa - "It's Up To You"
Gene Krupa - "Hop, Skip and Jump"